TELEVISION: American Idol is FIXED! Says the New York Times! “Representatives of AT&T helped fans of Mr. Allen at the two Arkansas events by providing instructions on how to send 10 or more text messages at the press of a single button, known as power texts. Power texts have an exponentially greater effect on voting than do single text messages or calls to the show’s toll-free phone lines. The efforts appear to run afoul of “American Idol” voting rules in two ways. The show broadcasts an on-screen statement at the end of each episode warning that blocks of votes cast using “technical enhancements” that unfairly influence the outcome of voting can be thrown out.” This service wasn’t provided to Lambert fans. TELEVISION: The Goode Family – Safe as Milk – Pasteurized, Bacteria-Free, Boring Old Milk! ABC’s new animated series, The Goode Family [Wednesdays, 9/8C], is the series from Mike Judge of King of the Hill fame. If it was a tenth as funny as that series, The Goode Family might be worth checking out. Instead, this comedy about the Goode family – vegan, non-confrontational, recycling, hybrid-driving – bends over backwards to balance the family’s save-the-planet sensibilities by making one character an Archie Bunker type. Instead of provoking genuinely spirited exchanges, however, it just renders both sides inoffensive. 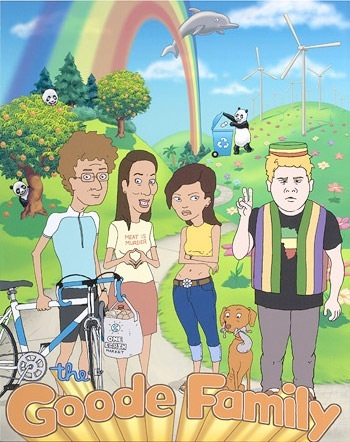 The Goode Family – Gerald [Mike Judge] and Helen and their son Ubuntu and daughter Bliss – live by the simple motto, WWAGD [What would Al Gore Do]. Gerald is a college administrator and Helen a community activist. Ubuntu and Bliss are high school students. The family’s politically correct plans always go wrong – as when Gerald and Helen adopt an African-American baby and one who, though technically African-American [being from Africa] is as white as they are. Whether they’re trying to put in an organically sound garden [elephant dung from a circus!!! ], or find something that the hulking Ubuntu can do competently – besides eat [can you say “football family?”], everything the family does to minimize its footprint on Planet Earth goes horribly awry. Or, at least, that was the plan. Somewhere along the way, the series creators [Judge, John Altschuler & Dave Krinsky] forgot the funny once they got past the white African-American thing. Even the vegan pet dog, Che is a one-gag character. To say that The Goode Family is boring is being kind. It’s more like the TV equivalent of an MST3K clunker waiting for its commentary track. Spare yourselves – unless you’re suffering from insomnia. Britain’s Got Talent. I’ll admit I never bothered to watch the other clip but this is quite good. TELEVISION: Diamonds – Mini-Series Gallops Madly Off In All Directions! 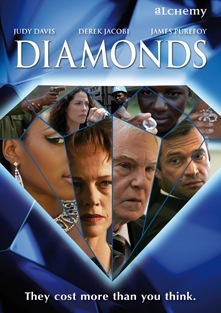 ABC’s mini-series, Diamonds [Sunday and Tuesday, 9/8C]wants to be the Blood Diamonds of television when it’s more like a morality play that fuses that excellent film with the baser aspects of 24 – and throws in some primetime soap that’s significantly less than 99 & 44/100% pure [or fun…]. When Senator Joan Cameron’s daughter is murdered in the Congo, it sets off a chain reaction that reverberates through the halls of both the U.S. and Congo governments and the offices of the Denmont Corporation – a major wholesale diamond supplier looking to go into retail for the first time. The high-powered includes Judy Davis [My Brilliant Career] as Senator Cameron; Sir Derek Jacobi [I, Claudius, Gosford Park] as Denmont CEO, Piers Denmont; James Purefoy [Rome], Louise Rose [Eastenders] as Luna Kormoma, Joanne Kelly [Vanished] as Stephanie Dressler, and Stephen McHattie  as Llewellyn Anderson – which guarantees that the cheesy, over-blown script is at least well acted. That script, by David Vainola and directed by Andy Wilson, is simultaneously overcrowded and simplistic. Arcs include the machinations behind the scenes at Denmont Corporation; the plight of a child soldier in the Congo; a model who becomes the face of Denmont Corporation – and its face; an investigation into the massacre that included the senator’s daughter; and a cantankerous prospector for diamonds in the Canadian Arctic. There’s a certain fascination in seeing a world-class cast acting the hell out of a Razzie-worthy production [too bad there’s not a Razzies for television], but it fades well before Diamonds’ four-hour running time. The really sad thing is that Diamonds is a co-production with the CBC [Canadian Broadcasting Corporation, so it’s a genuine international fiasco. My grading for this is based solely on the performances – otherwise, diamonds would rate an F.
Chris Diamantopoulos, a handsome 34 year old Canadian born actor, has been added to the regular cast for the up coming 8th season of the hit FOX series, 24. Diamantopoulos, who has been acting since he was nine years old and has done work on Broadway, will play Rob Weiss, the tough new Chief of Staff to President Allison Taylor. Viewers last saw this talented actor as Rodney on the recently cancelled series, The Starter Wives. 24 stars Kiefer Sutherland as Jack Bauer the top, though often times very rogue, agent of the LA Counter Terrorist Unit. 24 has a unique premise in which each season of the hit series takes place in one day as episodes unfolds in real time following a consecutive hour and it’s never a "good day" for Jack and the members of CTU. 24 airs on Monday nights at 9PM EST on the FOX Network. TELEVISION NEWS: Abc Has Released the V Promo, and it’s Good! Whenever people ask me what my favorite movie of all time is, I always say it’s “V The Original Mini-series.” For me it’s has always been and remains the perfect movie because at it’s core it’s a message movie that’s about something. I’ve seen it over 30 times and read the novel at least as much it’s the perfect example of how to write an adaptation – not just copying a screenplay but actually adding a lot of depth and missing moments to the original work. I couldn’t gen up the passion to be outraged at ABC’s upcoming remake. I wanted to just pretend it didn’t exist. But this week ABC posted a 2 minute promo clip and I hate to say it, or am happy to say – it’s excellent. It hits all the beats from the original while making it relevant for today’s audience with nicely updated effects that are the same as the original but different. I love that this time around they are inviting everyone up and it seems like they are hitting the religious undertones pretty heavily this time where that wasn’t present in the original. But so far, I really like what I’m seeing. No, this is not about Tom Hanks’ new movie as THAT “Angels and Demons” has been covered quite nicely by Sheldon, Michelle, and Christopher, here at Eclipse. But is you are a fan of such stories whose players involve Angels and Demons, then you could really offer yourself a treat by tuning in to Supernatural tonight. After all, they’ve been dealing with demons for four years now, and this season threw in a few angels into the spicy mix as well. And as an extra added bonus, there is excellent acting, outstanding writing and directing, and epic production values. Not to mention an equal amount of scares, thrills, horror, drama and humor. With the season finale completed last week, the ride begins all over again with this season’s premiere episode “Lazarus Rising” airing tonight. The season features factions of angels and demons struggling to avert an impending apocalypse. That’s right folks, we’re talking about THE Apocalypse! Alliances are questioned and no one can be sure that all demons are bad or all angels are good. And smack in the middle of it all are the Winchester brothers, Sam and Dean, who have dedicated their lives to saving people, hunting things, and battling all external demons while struggling with their own internal ones. The series bases all it’s main stories on existing myths, legends, and lore. Its goal is not to make fun or twist any one religious view, but take different cross-cultural lore and present a compelling story that will exercise your brain cells while entertaining the hell out of you. And the ultimate message within it all lies in the value of family and humanity. TV audiences are creatures of habit. They find their favorite show and stick to it, even if it means watching re-runs. But if you’ve already laughed at all the jokes on NBC, know ‘who dun it’ on CBS and want to get out of the ABC hospital for a while, then take the challenge to tune in and see for yourself what you might have been missing. The series stars Jared Padalecki (Gilmore Girls, Friday the 13th), Jensen Ackles (Dawson’s Creek, Smallville, My Bloody Valentine 3-D), and supporting cast members Misha Collins, Jim Beaver (Deadwood, Harper’s Island) and Genevieve Cortese (Wildfire). Promo pic ©The CW. And this is where I’m going to break protocol a bit since fan-made promotion videos often give you a better taste of the series and direct you to THIS, one of many that exist, to give you a 3-minute taste. SUPERNATURAL is on The CW tonight at 9:00 pm.